Sure, you’re a good citizen of your neighborhood. You don’t just leave Fido’s leavings where they fall. But you could be a better citizen of the planet by composting your dog doody. When you wrap up the poop in a plastic newspaper sleeve, you may be guaranteeing your dog will leave his mark in the landfill for decades. Instead, throw it into a specially designed backyard bin. Think of this dog doody composter as a pit toilet for pets (although you’re better off collecting the waste and putting it in the pit for Fido. He might fall in if he tries to use it). We must credit City Farmer in Vancouver for inspiration. Click here for a less detailed, but more photo-intensive, project outline. • Don’t add dog doody to your regular worm compost bin or hot compost pile. The worms will probably take care of it, but they are your pets too, so why would you be so cruel. Also, the dog doody contains dangerous pathogens and less beneficial worms. 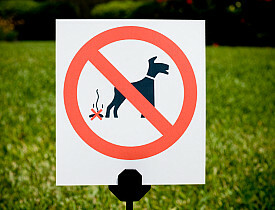 Composted dog poop should never be used on or around vegetable gardens. • You may also consider simply burying the waste, but even with a small dog, you may soon run out of spaces far enough from the vegetable garden. • Third, there are commercial dog composters available starting at about $30, but you will see that making your own is really cheap and simple. So, the best alternative is a pet poop pit far away from any vegetable gardens or water supplies. All you need to have is a large trash can (2 gallons or more), a bucket of gravel and septic starter. Ideally, you should repurpose a trash can. You are basically destroying and burying the thing, so just find the cheapest, most damaged can at a thrift store if you don’t have an extra bin at home. • Drill holes in the sides of the can, then cut off the bottom. • Dig a hole about two inches wider and 5 inches deeper than the trash can. • Fill the first five inches of the hole with gravel to facilitate drainage. • Drop the trash can in the hole. • Fill around the can with more gravel to facilitate drainage from the sides of the bin. • Start adding doody, then add septic starter. The best-known brand is Septonic, which is available at many hardware stores. • Add water, put the lid back on the can and let biology work its magic. As a newspaper reporter, I am only left with one worry: If you have potty-trained your dog and don’t need to leave newspaper all over the floor, and you have replaced the newspaper sleeve with biodegradable doody bags, are you going to cancel your newspaper subscription?